Golden sponge with raspberry jam and buttercream filling covered with sugar-paste icing and finished with handcrafted sugar decorations. 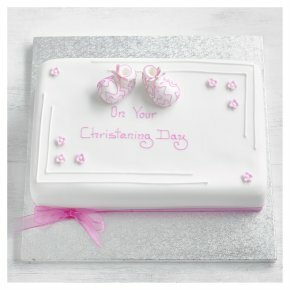 See the full range of Baby Booties Christening Cakes. Perfect when paired with our Pink Fiona Cairns Christening Biscuits.